Greenhouse Fabrics: IKATS…TIE-DYE... Oh my! Ikat patterns have quickly become one of the most popular styles in the fabric and upholstery industries. 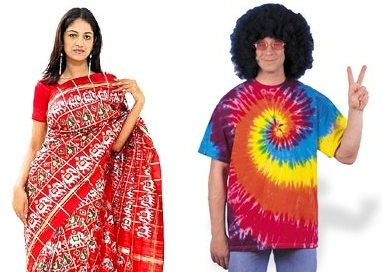 However, resist dyeing has been around for centuries and is responsible for everything from the 1960’s American tie-dye to modern Saris (the colorful robes popular with women in India and Pakistan). This is some serious flexibility! The Ikat pattern is thought to have originated in Indonesia, but it can be found in nearly every culture in the world and may have been developed independently in many countries. ‘Ikat’ is Indonesian for ‘thread’; though in language today it can be used to describe the cloth or the process of resist dyeing. The neatest thing about the traditional technique used is how the warp or weft fibers are dyed, such that when woven a “programmed” pattern begins to emerge. 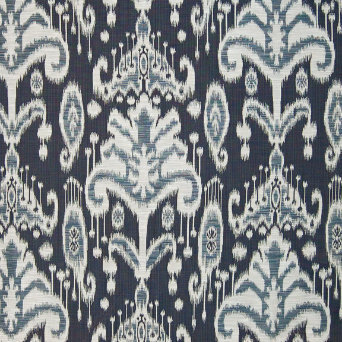 If you look closely at the fabric above (GH #11322 Ocean) you can see how the weft fibers stand out in the pattern. Bight, bold colors are also evident in the IKAT fabrics to showcase the beautiful, intricate patterns. Not only will we see them all over and throughout the home – they will continue to be seen on runways, in store front windows and on your neighbor’s shoulder bag. Please email us your thoughts and photos of your projects using Ikat fabrics at socialnetworking@greenhousefabrics.com and we will display them here next week!